Aramark Projects - Creative Communications and Graphics, Inc.
CCandG has worked with ARAMARK on various projects over the past few years. Some of our most exciting projects tasked us with creating unique tools to help the ARAMARK sales team deliver results fast. Our most recent projects range from children’s nutrition interactive presentations to k-12 Food Assessment data modules. 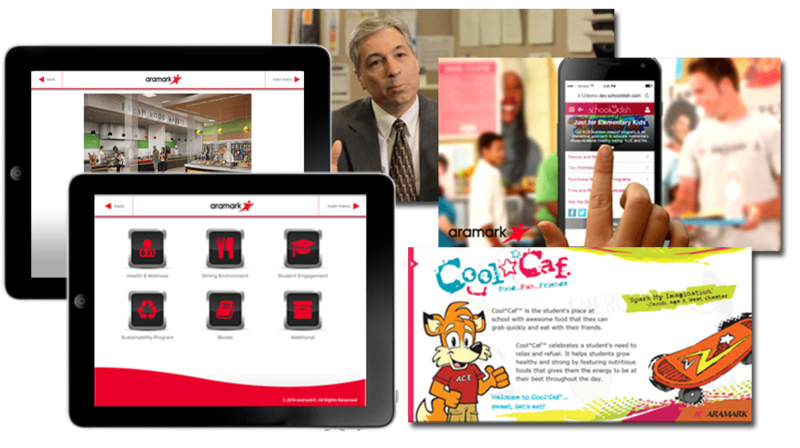 We’ve also created an iPad app to deliver large scale proposals to the various school districts that are interested in ARAMARK’s services. This app utilizes DropBox to allow for easy application updates at any time, anywhere. CCandG has also production many professional videos for advertisement purposes. We handle all of the video production from shooting to final edits. The K-12 Food Assessment site was created to provided ARMARK with the ability to quickly assess a school’s need for ARAMARK’s services. This site provided the users with a quick, 10 question, survey that accurately calculates the amount of money that you could save if you switched to ARAMARK’s services. After the survey, the site then outputs a PDF report that allows for easy comparison of the results.